Welcome to focus on Chinese motorcycle industry again! Chinese motorcycle industry developed from sprouting to refulgence and then hitting the bottom. Motorcycle has become the past instead of a big durable consumer product that makes Chinese proud. Motorcycle lost 10 years. However, we are now facing a new chance for rebounding. Motorcycle companies are transforming and upgrading. Made-in-China are turning to created-in-China. The consumers’ demand has changed from transporting to entertainment. Motorcycle companies are setting their sail to bring Chinese motorcycles all over the world. All these have laid a solid foundation for the motorcycle industry and brought brand new development opportunity. 2 completely different development directions, equipment manufacturing and special-interest individuation, making the resource distribution of motorcycle industry more reasonable and the product system richer. Thanks to the international brands that expand Chinese market and bring vitality to Chinese motorcycle market, the product line put on Chinese market by European, American and Japanese brands has been expanded from basic models to more classic and more comprehensive models. The entering of these classic models has driven the international high-end part brands entering into China and they have refreshed the domestic consumers’ understanding of motorcycle and detonated the consumption of high-end motorcycle. This has also led the trend of research and development of Chinese motorcycle companies and changed the decline situation of Chinese motorcycle industry. Motorcycle has been given meaning of fashion, sport and passion by young people. trade and marketing and the sharing and symbiosis in information, technology and international market, so as to make a globally oriented high-end motorcycle exhibition and a mass oriented world top motorcycle event. 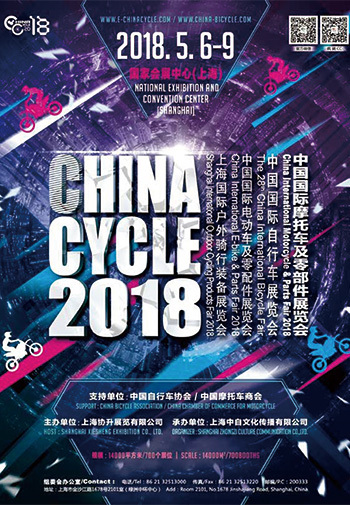 This fair will certainly become a brand new platform of Chinese 2-wheel vehicle industry and a platform letting the public re-understand the motorcycle! will bring brand new visual feast for you!